Made by Reckitt and Colman Australia Ltd in Australia, Oceania, c 1930s-1940s. These are two examples of Reckitt’s Bag Blue laundry blue bags made in Australia by Reckitt and Colman (Australia) Ltd in about the 1930s and 1940s. The blueing process was used to whiten material made yellow from soap and age. After washing, a ‘blue bag’ was dipped in a clean tub of cold water. Each piece of clothing was turned inside out and plunged into the water, then rinsed. ‘Blue bags’ were also handy as a remedy for bee stings. 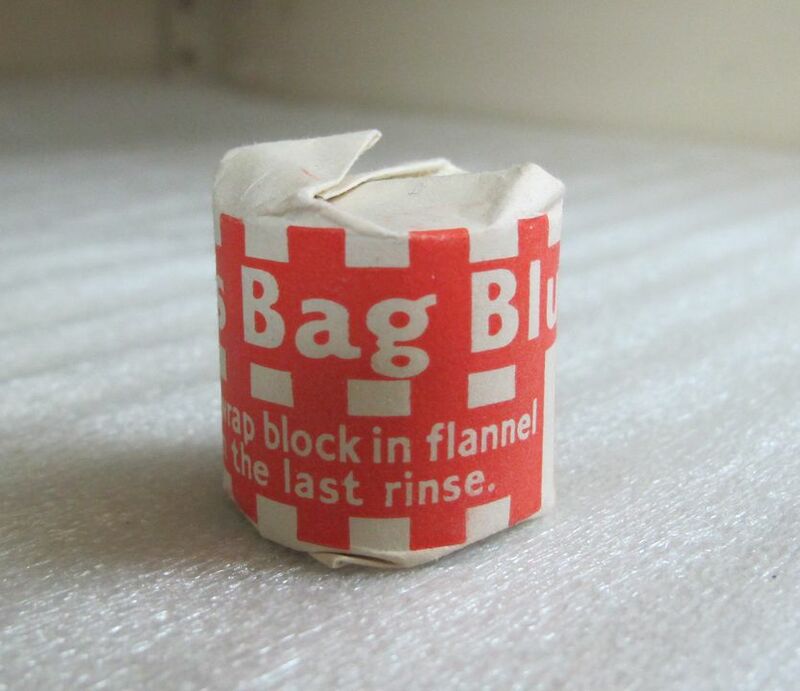 Two cylindrical blocks of laundry blue, wrapped in a cream paper with red stripes. Text across the paper wrapping reads 'Reckitt's Bag Blue / Remove label wrap block in flannel / and stir in the last rinse'. The laundry blue was stirred into the final rinse when washing cloths to whiten the clothing. made by Reckitt and Colman (Australia) ltd.
Jeremiah Colman began milling flour and mustard in Norwich, England, in 1814, diversifying in the 1850s to produce starch, wheat flour and laundry blue. In 1940 Isaac Reckitt rented a starch mill in Hull, England, which he purchased in 1848, producing household products such as starch, washing blue and black lead for polishing. Reckitt later passed on his business to his four sons. In 1886 Reckitt & Sons began its expansion to open businesses around the world, the first being in Australia. In 1938 Reckitt & Sons merged with J&J Colman to become Reckitt & Colman Ltd. Reckitt & Colman sold the Colman's food business in 1995 but continued to produce some food products, such as mustard, mayonnaise and barbecue sauce. In 1999 Britain's Reckitt & Colman merged with Dutch company Benckiser NV to form Reckitt Benckiser, one of the world's leading manufacturers of cleaning products.